If you’re looking for an example of the Strong Towns mindset applied to local economic development, you couldn’t do much better than Economic Gardening. It’s an approach to growing a city’s job base and economic prosperity that doesn’t involve a dollar of subsidy to a large, outside corporation—and produces better results than those subsidy programs, too. Economic Gardening predates the Strong Towns movement by 20 years, but you can think of it as the economic-development analogue to our Neighborhoods First approach to public infrastructure: a program that seeks to make small, high-returning investments instead of big silver-bullet gambles, by capitalizing on a community’s existing assets and latent potential. The approach has its origins in the Denver suburb of Littleton, Colorado, in 1988. Martin Marietta, a predecessor of Lockheed Martin, was Littleton’s dominant employer in the 1980s. The company was in the war business—it’s a major military contractor. As the Cold War wound to an end, the U.S. found itself, as a country, divesting from the war business, and in 1988, Martin Marietta laid off thousands of its Colorado employees. Littleton’s City Council tasked economic developer Chris Gibbons with a challenge: find local businesses that already exist that want to grow. Figure out what these startups’ needs are and how we can help them. Provide them with technical support, access to databases and analytical tools that can help them find customers, resources to help them manage the challenges of rapid growth. We’re going to grow our own jobs locally, instead of trying to import them from outside. Gibbons’s efforts were phenomenally successful, and sparked a whole alternative movement in economic development: Economic Gardening. Numerous cities and states now have Economic Gardening programs, and Gibbons and the Edward Lowe Foundation continue to develop and promote the concept through the National Center for Economic Gardening. In 2013, we had Chris Gibbons on the Strong Towns Podcast as a guest to explain what economic gardening is, what kinds of companies it can benefit, and the many successes the approach has enjoyed. It’s one of our most popular podcast episodes of all time, and so we’re featuring it as the final entry in our Strong Towns Podcast Greatest Hits series. Yes, we said “final.” Next week—Monday, April 22nd—Charles Marohn will be back from hiatus with a brand new episode of the Strong Towns Podcast. And we’ll keep rolling out new episodes on Mondays after that, so keep us in your iTunes feed or wherever you get your podcasts, and keep doing what you can to build strong towns. Here's the audio from the championship round of our Strongest Town Contest. We invited representatives of our final two contestants—Quint Studer of Pensacola, FL, and Nancy Pearson of Portsmouth, NH—to join us for a live Q&A webcast and each make the case for why their city should be voted America's Strongest Town. Now it's your turn to vote—visit www.strongtowns.org/strongesttown before noon CDT on Thursday 4/11/19 to cast your vote for either Portsmouth or Pensacola! Nancy Pearson shares her vision for downtown and the steps the city is taking to get there, how Portsmouth capitalizes on its port, and answers a question from a Strong Towns member about how Portsmouth prepares for potentially catastrophic floods. Justin Fortney shares plans for a traffic calming project to better connect neighborhoods to Guthrie’s downtown, how the city engages its residents, and answers a question from a Strong Towns member about how Guthrie listens and responds to the needs of its residents. Quint Studer discusses the current projects Pensacola is working on to make the best use of its existing infrastructure, how Pensacola encourages local business creation, and answers a question from a Strong Towns member about how Pensacola encourages infill development. James Fogarty discusses the current projects Safety Harbor is working on towards becoming more financially resilient, what steps the local leaders are taking to foster Safety Harbor's walkable downtown, and answers a question from a Strong Towns member about how Safety Harbor plans to expand its core areas. There are a lot of reasons that Strong Towns founder and president Chuck Marohn is excited about finally writing a book that encapsulates the message of our organization and our growing movement. The predicament our cities and towns find themselves in today is the result of a massive, ill-conceived experiment in upending the way we live and the way we organize our communities. Our predecessors didn’t undertake this experiment because they were stupid. Or because they were evil. And we won’t get out of it because we’re somehow wiser or better than they were. But as our existing institutions buckle under the weight of accumulated, unsustainable liabilities, we do need to talk not just about how to keep the lights on and the streets paved, but about how to rediscover better ways of organizing our places and living in community. Building antifragile places, places that can not only endure economic and technological shocks but come back stronger, requires respect for ancient wisdom at least as much as present-day insight and intelligence. Building strong places, places that are self-sustaining—so that we’re neither living off the largesse of others or impoverishing the next generation—is going to require a different understanding of how we build community as a collaborative endeavor. And so, as much as we at Strong Towns draw on the insights of economists and urban planners and policy experts, we also see value in drawing on the insights of historians and philosophers and scholars of the human condition. It no doubt surprised and puzzled a number of our podcast listeners back in 2013 when Chuck Marohn chose to invite John Dominic Crossan, a noted scholar of the historical Jesus and the New Testament, onto the Strong Towns Podcast. Marohn is a Christian and has written things informed by his faith from time to time, but Strong Towns as a movement has no religious affiliation, just as we have no partisan or ideological affiliation. And yet, this conversation has a lot to offer Christian and non-Christian listeners alike, as Marohn and Crossan discuss how to interpret, honestly and in context, the choices made by people who lived two millennia ago, and the ways those people chose to talk about them. The physical challenge of this generation is to contract our cities to something financially viable. This is prompted by the financial challenge of not having enough money to make good on all the promises prior generations made to themselves. The accompanying social challenge is going to be to make this transition without leaving people behind, without leaving the least empowered among us isolated on the periphery of the community. All we here in the Strong Towns movement can do is give America the softest landing possible. And this is where John Dominic Crossan comes in. What is the typical response of a powerful society with a high degree of comparative affluence to decline? How do empires respond to the collapse of their empire? What have we learned from the ancient Persians, ancient Romans and even from the modern Germans in the decades before World War II? As [Crossan] pointed out in that podcast, the normalcy of civilization is a tendency to violence, often violence justified by religion. By understanding that, and understanding how the Christian God is one of peace and not of retribution, we can be in a position to resist our worst urges during trying times. These kinds of conversations will always have a home in the Strong Towns movement, and that’s why we’re featuring this interview as part of our Strong Towns Podcast Greatest Hits series. A lot of professions and organizations have an unspoken code, one that says, “We may air our disagreements internally, but to the rest of the world, we present a united front.” The police and the military, for example, tend to be this way. Families are often this way. This code can engender a really powerful sense of solidarity, which isn’t always a bad thing. But do civil engineers need a code like that? And what happens when speaking out for badly needed reform offends those who see it as an unjust provocation, attack on their livelihood, or even an act of betrayal? In our of our most important Strong Towns Podcast episodes of all time, and #9 in our Greatest Hits series, Strong Towns founder and president Chuck Marohn discusses his own experience with these attitudes, in an incident which occurred in early 2015.
Who Represents the Engineering Profession? Chuck Marohn is a licensed Professional Engineer (PE) in the state of Minnesota. He is also a vocal advocate who has been extremely critical of aspects of the engineering profession, including in particular the American Society of Civil Engineers (ASCE). Chuck has called ASCE the leader of the Infrastructure Cult for its relentless advocacy for more money for civil engineering projects, no matter the cost to society. Let’s get this straight: a Professional Engineer (PE) license is a big deal. The licensing test is extremely difficult and rigorous. Most civil engineers, Marohn included, take great pride in their PE title. And yet, criticizing ASCE does not, and should not in anyone’s minds, equate to criticizing the engineering profession. ASCE is unlike many professional organizations, in that it engages in routine political advocacy. ASCE advocates in the public sphere for things that will produce more money for more projects for more engineers—getting more things built out of concrete and asphalt and steel. Marohn argues strongly that this mindset—more is better—is a deeply harmful dogma within the profession at a time when most American cities and towns suffer both a public-safety crisis (because our streets are too wide and induce unsafe driving) and a fiscal solvency crisis (because our streets are too wide, our development pattern is too spread out, and we have built far too much infrastructure). The ASCE actively promotes the overbuilding of unnecessary and even harmful infrastructure. As an example, Marohn cites the often-used term “functionally obsolete bridges,” heard in debates about how much state and federal money is needed for infrastructure repairs. Many of these, it turns out, are simply one-lane bridges in rural areas, which are not actually in danger of falling down—but the “standard” says they should be two-lane. Because of the way engineering contracts work—often as a percent of construction cost—there is little to no incentive to cut costs. There is little to no incentive to do things in a profoundly more frugal way. There is little to no incentive to question industry design standards for things like street widths, if doing so would also mean losing out on project funding. In our cities and towns, our wide streets are killing people. Design could save lives. When you get into that conversation, some engineers get very upset. And one of those people, in 2015, got upset enough to challenge Chuck Marohn’s license. Spoiler alert: The complaint went nowhere—the state licensing board found “no violation” and recommended no further action. And a lot of people spoke up in defense of Chuck and Strong Towns, including a number of lawyers and the Union of Concerned Scientists. The engineering profession, says Marohn, is full of good people who want to make the world better. And increasingly, those good people are questioning some of the old dogmas of their profession. This podcast episode, one of our Greatest Hits that you don’t want to miss, makes an eloquent case for the legitimacy and importance of such questioning. You are grossly negligent if you show a conscious indifference to the safety of others. In other words, you’re aware that the safety of others is endangered, but you don’t do anything to act on that knowledge. Virtually nothing Strong Towns has done or said in ten years has inspired as much anger or controversy as the times we have argued that the engineering profession, for designing and building unsafe streets, deserves a share of the blame for the statistically inevitable tragedies that occur on those streets. And yet, this is some of the most important work we have done in our ten years. Because lives are at stake. People continue to be killed on urban streets that are designed to move cars quickly through complex environments. There’s more where that came from. All over this country, we build urban environments where we tell ourselves we want lively human activity. We fill them up with businesses, libraries, parks, schools, homes, where people are certain to be coming and going. And then we run stroads through them that are engineered so that drivers will travel at speeds that will kill a person who is hit. We design streets that are forgiving of driver error—wide lanes, clear zones in case you run off the road—as 1800 cars did in 15 months on on road studied in Orlando. But in doing so, we ensure these streets are utterly unforgiving of errors committed by those on foot. We do this despite that we know death will be the statistically inevitable outcome sooner or later. Is the engineering profession intellectually and institutionally prepared for a world in which we stop doing this, and accept that urban environments require slow streets? In a bizarre round of the endless, massively multiplayer game of Telephone that is the internet, a recent Forbes headline pronounced, “Wealth Guru Plans Dutch-Style Car-Free Bicycle-Friendly City Near Boulder, Colorado.“ Other publications quickly jumped on the story about a supposed eco-friendly, urbanist, cycling utopia in the works at the base of the Rockies, which would have a population of 50,000 people in a single square mile and be the joint project of a Dutch urban design firm and a popular Colorado-based early retirement blogger. Unfortunately for those hoping to sell the car and move to Cyclocroft, there are no actual plans to build this experimental city. The whole thing was just a thought experiment, a series of tweets sharing the detailed (but fictional) 3D mockups of what a better and more fiscally resilient way to live in that corner of the world might look like. Fortunately for those who like good, thought-provoking content on how to detach from the mania of modern life and live more deliberately, the one part of the brief Cyclocroft craze that is real is the “wealth guru” who put the idea out on Twitter as food for thought. His name is Pete Adeney, but you probably know him as Mr. Money Mustache. He is a fan of Strong Towns, we’re fans of his, and he just so happens to have been our special guest on one of the most popular Strong Towns Podcast episodes ever, published back in April 2016. Here it is, #7 in our Greatest Hits series. That’s the phrase that Strong Towns founder and president Chuck Marohn uses to describe Mr. Money Mustache, and for good reason. The core insight of Strong Towns is that many communities are trapped in a cycle of unproductive, debt-fueled growth for growth’s sake—and that our cities and towns need to quit the rat race and focus on building great places that generate real, sustainable wealth from the bottom up. The core insight of Mr. Money Mustache’s writing is that many individuals are trapped in a cycle of unproductive, debt-fueled consumption for consumption’s sake—and could also stand to take a step back and live better—and wealthier—by avoiding debt and investing their resources in the things that actually, demonstrably improve their lives. • How Mr. Money Mustache manages to drive only 400 miles per year (aside from a couple out-of-town trips) while living in suburban Colorado. Hint: it has less to do with bicycling—though he does bike—and more to do with a local lifestyle, arranged so that he can get most of the things that he needs and that are rewarding to him within a few miles of home. • What it looks like to live debt-free on $24,000 a year. Hint: it doesn’t look like obsessive frugality, or like self-imposed poverty. It looks a lot like evaluating your mundane, daily choices to figure out which ones are actually high-returning in terms of happiness: something we at Strong Towns analogously encourage cities to do with their own investment decisions. MMM describes his philosophy as, "Getting the benefits of the modern lifestyle while slicing out the things that don’t benefit us." • The benefits of living as though debt is an emergency—something to be resolved as quickly as possible—not a constant fact of life. “It’s very natural for us as humans to live for today,” observed Marohn. “To say ‘these things [we want to spend money on] are prerequisites,’” even if that means we need to go into debt to acquire them. For an individual, getting out of that mindset can be challenging and scary, but it can be immensely rewarding. And then think about how your city could do much the same thing, if its leaders got disciplined and deliberate about where they’re spending citizens’ tax dollars—and made sure it was on the things that truly generate long-term prosperity and quality of life. That’s the Strong Towns approach. One might call us the Mustachians of urban growth and development. Just don’t look for us to announce a master-planned utopian bicycle city anytime soon. Once a month, we host Ask Strong Towns, a live Q&A webcast open only to Strong Towns members and select invitees, to give you a chance to ask your burning questions about our vision for change, and how the Strong Towns approach might apply in your unique place—and give us a chance to share our answer with the world, so it might help other Strong Citizens. Here’s the audio from our February 2019 installment of Ask Strong Towns with founder and president Chuck Marohn and communications director Kea Wilson. 02:55 We've been going through some serious parking debates here in Buffalo and it got me wondering about residential parking. I wonder if, like on-street commercial parking areas, residents should also be asked to compensate the city for the space their vehicles take up. Additionally, should visitors be allowed to take up otherwise free spaces on residential streets near commercial areas? I am curious to know if Strong Towns has any thoughts on residential parking permits, if you've seen them used effectively, or if there any studies exist. 10:30 When will Strong Towns travel destinations and dates be announced for later this year so I can perhaps sync it with travel plans? Also, I didn't see any California destinations. Any hope of expanding in the direction? 16:25 I’ve seen big box chains build an “urban” model of their store to fit into places like NYC. Is this the model a strong town should mandate or should our towns refuse all big box development? 32:30 As cities make budget cuts, the decision makers often talk about the need to prioritize “core services”. What, in the Strong Towns framework, qualify as core services, secondary services (not absolutely necessary, but better to have than not have), tertiary services, etc.? 38:00 My town government recently created a "task force" to address the declining proportion of young adults and children, but then decided to expand the mission to address all related issues (e.g., affordable housing, etc.). What would a Strong Towns answer be? 46:00 City X is an upscale suburban city that is developing an dense urban environment. It currently has a moderate amount of high-end empty commercial space. They are subsidizing the development of massive amount of new commercial space that will create a large amount of unrentable property unless we have a dramatic increase in growth. How do you convince the public it is time for them to demand their economic development commissions and politicians quit digging? 52:50 Any advice when having discussions with state Departments of Transportation on altering their plans to widen a state highway that cuts through your town? We have a public safety epidemic in America. And it starts and ends on our roadways. In 2017, over 40,000 people were killed in motor vehicle crashes in the U.S. More people are killed in traffic each year than by firearms. And a huge proportion of those crashes involve vehicles that are speeding—26% of them, according to the National Highway Traffic Safety Administration. Pick just about any news report or radio or TV interview on this topic at random, and you’re likely to hear two solutions discussed: education and enforcement. By enforcement, we usually mean traffic stops. Unfortunately, the most common way we enforce speed and other moving violations—through routine, “investigatory” traffic stops by police—ends up leaving road users, law enforcement, and communities all less safe, while potentially distracting us from the things we really ought to be doing if we want to bring that 40,000 statistic down dramatically. In July 2016, Strong Towns founder and president Chuck Marohn published a call for communities to end routine traffic stops. Marohn took this stance in the wake of the death of Philando Castile, who was shot and killed by an officer in Minnesota on July 6, 2016 after being pulled over for a broken taillight. Subsequent reporting revealed that Castile, a 32-year-old man, had been pulled over by police 49 times, usually for extremely minor offenses. This is not an uncommon experience for young black men, which Castile was, and is indicative of the way traffic stops are often used in low-income, high-crime communities: as a sort of surveillance tool that allows police to detect other illegal activity. Key to the usefulness of traffic stops as an all-purpose crime fighting tool—a pretext to pull over anyone you want to check out—is the fact that nearly everyone breaks traffic laws routinely. Speeding. Rolling stops. Turning or merging without signaling. Nearly everyone breaks traffic laws routinely. They’re indiscriminate: It’s not uncommon to find roads all over America where the vast majority of drivers are exceeding the speed limit. In fact, we design our roads to all but ensure this: the engineering principle of “forgiving design” (where it’s the mistakes of the driver that are forgiven, not so much the pedestrian) means that a road with a posted speed limit of 30 miles per hour might have straight, even, wide lanes that make it psychologically comfortable to go as fast as 60 miles per hour. On such a road, given the constant focus it takes to keep to a lower speed, it’s no surprise that many drivers don’t. They’re dangerous for police: Traffic stops are the single most dangerous activity that many police officers themselves engage in. More officers are killed and injured doing these stops than doing anything else. There you have a humane and effective way to deal with the real problem: deadly speeds on far too many of our streets. For the fifth installment of our Strong Towns Podcast Greatest Hits series, we revisit a 2017 conversation between Strong Towns podcast host Chuck Marohn and acclaimed writer and photographer Chris Arnade. Arnade has a history that makes him unusually well-positioned to see things from multiple angles. His life has taken him from a small town in Florida, to a PhD in particle physics, to 20 years as a Wall Street bond trader, to producing a powerful series of photographic essays for The Guardian on the toll of addiction and social disintegration in America’s small towns and big cities alike. As a non-journalist, Arnade was able to break a cardinal rule of journalism: don’t get involved. He made friends with addicts and homeless people, helped them out with cash when needed, went to court hearings with them, gave them rides, and learned a lot about an America that is invisible to many of us. Strong Towns’s Chuck Marohn was prompted to interview Arnade after reading a Medium piece on Cairo, Illinois. (Arnade’s original piece appears to have been deleted.) Cairo, located on a narrow peninsula of solid ground where the Mississippi and Ohio rivers converge, has endured decades of steep decline. Home to about 2,000 people, mostly African-American and mostly poor, very little industry remains in the city, and the historic downtown is so empty that, Arnade says, on his visit there he couldn’t find a place to use the restroom. As a planner and engineer, Marohn, upon viewing photos of Cairo’s desolation, was taken by the town’s legacy of failed experiments to bring back the prosperity it had lost—such as the striking visual of an ornate “Historic Downtown Cairo” arch framing a street of boarded up shops. Arnade, on the other hand, helps us understand the sociology of a place like Cairo, Illinois, or Portsmouth, Ohio, or Hunts Point in the Bronx. Today we're sharing the audio (video is available on our website) from our January 29th Ask Strong Towns: Celebrity Edition webcast conversation featuring Strong Towns President Chuck Marohn and one of America’s top experts on mega-retailers (both big box stores and online titans such as Amazon), Stacy Mitchell of the Institute for Local Self-Reliance. We’ve featured Stacy Mitchell before, including this interview back in 2016, in which she discusses her book Big-Box Swindle (a book of which Chuck reveals he owns not one, not two, but three copies). More recently, her research and writing on the rise of Amazon grabbed our attention over and over again, particularly this widely-circulated article for The Nation. We invited Mitchell to join us on our monthly ask-us-anything webcast to discuss her work and answer Strong Towns members’ questions. The far-ranging discussion here touches on the trends in retail consolidation, including Amazon’s dramatic expansion and monopolistic aspirations; the threat that these behemoths pose to a healthy local economic ecosystem of local businesses; the role of tax incentives in the HQ2 race and beyond; and perhaps most importantly, what communities can do to push back and choose a better path. No, it's not a riddle—but it probably sounds like one unless you've read the work of Nassim Nicholas Taleb. And whether or not you’ve read Taleb, if you're interested in how cities are complex, unpredictable, adaptive systems—and how we ignore that fact at our peril—we have the podcast for you. It's no secret to regular readers of Strong Towns that Chuck is a big fan of Nassim Taleb. For years, we've referred to Taleb as the "Patron Saint of Strong Towns Thinking" for his insights about how complex, antifragile systems weather risk and uncertainty, while top-down, over-engineered systems are vulnerable to catastrophic failure. Taleb is one of the most innovative thinkers of our time, and if you haven't read his work, we strongly recommend it. But he's not a light read, so this podcast is an excellent primer both on the idea of antifragility, and on how it pertains to cities. A city is naturally a complex, organic thing with emergent properties. It is the product of millions of interacting decisions and feedback loops. But in the 21st century world, we too often impose top-down systems of order that don't respect that complexity, through financial arrangements and planning regulations. For example, we may decide that next to a highway interchange is the perfect site for a big-box store: it has the access and can handle the traffic. So we zone for it. What happens when the land owner has unusual circumstances, or the market can’t support that store in that location? Are we prepared to allow something else to emerge? In a neighborhood of single-family homes, zoned to be single-family homes forever, what happens when economic circumstances or demographic trends change in such a way that stresses the system? A downturn in the local housing or job market? The answer is often predictable, inexorable decline for these neighborhoods, because they can't evolve into something else that works. We don't have any type of natural renewal mechanism. "In a good organic system, things fail early and fail frequently" says Taleb. The artificial order and efficiency of top-down planning doesn’t prevent failure, says Marohn. It merely makes risk invisible, until that risk builds up and things break catastrophically. It makes cities more fragile. Modern planning is a bit like helicopter parenting. The parent who hovers over their child, resolves interpersonal conflicts for them, intervenes with his or her teachers the moment there’s an issue at school, may raise what appears to be a successful and confident kid… only to see that veneer of confidence fall away when the child is an adult underprepared for the adult world. So too does over-intervention in the planning of our environment lead to the illusion of stability and success. Perhaps the most powerful insight Taleb offers is that none of these insights are new. We were on our way to building very strong places for a very long time. When you visit a European city and see that the sky-high property values are in neighborhoods that retain many of their medieval or ancient characteristics, why is that? These places have survived for hundreds or even thousands of years. How many of our places today will do so? In this classic episode from 2015, Chuck talks with Steven Shultis, a longtime friend of Strong Towns, about low-income urban neighborhoods and, in particular, urban schools. Shultis started the blog Rational Urbanism to chronicle his experiences and thoughts on living in a poor neighborhood of a poor city—Springfield, Massachusetts—not out of necessity but choice. Steve and his family made that choice because their neighborhood offers, in many ways, an excellent quality of life—walkability, community, great local businesses, a beautiful historic downtown virtually at their doorstep, a spacious Victorian home—at a price that puts it within reach of people who could never have that life in Boston or New York. And Springfield is the kind of place that is built to be functional and resilient—the quintessential strong town. If you’re poor there, it’s a relatively humane place to be poor. You don’t need the expense of a car, at least. For Shultis, a Spanish teacher working in nearby suburban Connecticut who could have lived elsewhere, choosing to live downtown in his hometown was a form of “arbitrage”—a way to live "beyond my means, within my means." "You can't live in that part of town if you have a family, or are going to have one. What about the schools?!" Challenging the narrative of "bad schools" with both data and personal experience. Why test scores aren't a good indicator of school quality. Whether any of the usual metrics of school quality are good indicators. How going through the "bad" Springfield Public Schools didn't slow down Shultis's kids academically—but it did challenge them socially, in ways that may have made them more well-rounded and capable adults. Why urban areas, even ones with high poverty, are not dangerous places to grow up. It's actually, statistically, less dangerous to be a teenager in a city like Springfield than in suburbia. Hint: the reason comes down to the top two causes of death for teens: auto accidents and suicide. What Springfield did wrong in trying to stem the flight of wealthier residents to the suburbs. And what Springfield did right, and has going for it to this day. Hint: a lot more than you might think! In fall 2014, Strong Towns founder Chuck Marohn participated in the America Answers forum put on by the Washington Post, sharing a stage with, among others, then-Vice President Biden and then-Transportation Secretary Anthony Foxx. In this reflection recorded after the fact, Chuck analyzes clips of three forum participants’ remarks on the subject of infrastructure spending: Andrew Card, who served as White House Chief of Staff under George W. Bush and Transportation Secretary under George H.W. Bush; Ed Rendell, the Governor of Pennsylvania from 2003 to 2011; and Vice President Joe Biden. Their respective framings of America’s infrastructure crisis inspire Chuck to ponder a disappointing reality of recent American politics: neither the political left nor the right seems to talk about infrastructure coherently. Where Card has a crucial insight is where it comes to solutions to our infrastructure woes: they must involve feedback mechanisms. When the users of infrastructure pay for its maintenance, we end up building things that make sense in the long run. When those who pay and make funding decisions don’t have skin in the game, we end up with things like the TIGER grant program, which has a history of funding bizarre, unnecessary, crazy projects. Let’s talk about user finance, says Card. Instead of the gas tax, how about taxing vehicle miles traveled, or the weight of vehicles (corresponding to wear and tear on roads)? How about incentives for trucks to drive at night to relieve daytime congestion? How do we get more real value out of the system we have? Chuck provides a brief update on where we're at with the Strong Towns Podcast and what to expect in the coming weeks. Our last new podcast episode of this year finds Strong Towns founder and president Chuck Marohn busily baking cookies ('tis the season), and musing on a series of questions posed to him by a Detroit-based journal. The questions get at the heart of some of the hot-button issues in urban planning: the legacy of systemic racism in our cities, the role that urban planning might play in combatting and correcting for this legacy, and how 21st-century fads (the "creative class", new transportation technologies, et cetera) play into the discussion. Chuck questions the notion that contemporary planners-with-a-capital-P are well-positioned to correct for the mistakes of the past, particularly with regard to racial segregation and disparities in our cities. One reason: we haven't really reckoned honestly with that legacy. It's easy to caricature redlining and other past policies—"Wow, that's just horrifically racist! We today would see that as beyond the pale." And yet, Chuck argues, we do things today that produce more or less similar results. Segregation is still pervasive, and so are disparities in economic outcomes. At the level of top-down policy, especially federal policy, unfair outcomes have a way of embedding and perpetuating themselves. And it's not because most individuals are mean-spirited racists of a sort we can simply dismiss as incomprehensible to our modern, enlightened selves. There are tougher questions we need to ask ourselves about who gets the power to shape cities. Those with advantages—with preferential access to the levers of the system—are going to use those advantages for the benefit of themselves and those they care about. "How," Chuck asks, "do we empower communities that are disempowered today so that they have that capacity as well? So that they can lift themselves up, the ones they love up, and the people around them up?" Until we reckon with that question, our cities will too often be fragile places AND places where the least powerful suffer the most. The importance of the "creative class" in cities, and what planners sometimes get wrong about the concept. Why both the political left and right invoke images of the post-World War II era as a model to aspire to today. Why scooters are great, but scooters aren't the answer to carbon emissions or car dependence. Why the same is true for (insert transportation technology here). Today on the Strong Towns Podcast, we're bringing you the audio from the latest edition of our live, bimonthly ask-us-anything webcast, Ask Strong Towns. On November 16th, 2018, we invited Strong Towns members to ask their questions—any questions at all—of our founder and president, Chuck Marohn, and our communications director, Kea Wilson. • My city of Bothell (suburb of Seattle) and the cities all around us charge impact fees on new construction that cover the costs of traffic, schools, parks, and fire. The city of Seattle does not impose impact fees, relying on other taxes to cover all these needs for the city. What’s the Strong Towns approach to impact fees? Are they a good way to pay for civilization, or a bad idea? • In light of 2018's devastating hurricane and fire season, how would Strong Towns approach the rebuilding process? I'm afraid we're about to spend billions of dollars merely replacing losses with fortified structures, rather than rethinking our development pattern to increase resiliency. • I think miles of water line per customer would be a good measure of sprawl and infrastructure maintenance needs. Is this data easily retrieved for different cities and towns? Is there a standard to compare to? • We are losing valuable historic housing due to shoddy flips by investors. How dow we protect our dense and affordable housing from speculation? These homes are traps for unwary young buyers who like the initial look, but the shoddy workmanship dooms them to unnecessary expense and stress. I fear many will lose these homes, as their costs to fix non-cosmetic errors may be prohibitive. It reminds me of the period before the sub-prime crisis. I looked at a historic home recently that was marked up over 5 times what they paid for their initial investment. It was a potential buyer's nightmare. The realtor stated that poor flips are a regular occurrence. • I live in the historic district of my town near the old main downtown street. At some point they decided to make that street part of US-1, so it's wider and cars go faster, and businesses have failed consistently ever since. When citizens raise concerns, the city blames the state and claims they have to abide by state requirements about things like lane width. What's the best way to restore the street to be people-centered? • Given the state of the retail industry, the go-to building typology of residential over commercial space ends up not being financially viable, even in traditionally designed areas. This is certainly the case in Annapolis, where the only retail that is doing well is food (restaurants), but that only scales so far. What suggestions do you have to deal with this? • What are some first steps for smaller cities to lay the groundwork and begin revitalizing their historic downtowns? This is the final day of our fall 2018 member drive. Today, we're sitting by the phone waiting for you to call. Seriously. If you've been waiting — been putting this off all week — we're here to help you get past the finish line. Ask for me. Ask for Kea. Ask for Daniel or Jacob or Bo or Michelle. We're all sitting here waiting for you to call. We'll chat a little and then get you signed up to be a member of Strong Towns. It's really that easy. Or, just sign up on your own. That's easy too. Just click here to join a movement that is pushing for urgent change in our culture of growth and development. Today's the day. Before you head out for your pre-holiday weekend, take a quick minute to make a huge difference. Strong Towns founder and president Chuck Marohn is in Boerne, TX today to give the Neighborhoods First talk: one of our signature presentations. It's all about how to shift from a strategy of a few large, high-risk investments to many small, incremental ones. The support of our members is helping us get this message in front of more people every year. And it's paying off. Not least of all in Chuck's hometown of Brainerd, Minnesota. In this podcast episode, Chuck talks about an ongoing controversy involving the public schools in his town, and how he is beginning to hear Strong Towns language and ideas reflected in the way community members and public officials are framing the issues. This hasn't happened because Chuck is coaching people what to say. This has happened because of the power of our ideas and repeated exposure to them. We give you the tools and the language you need to change the terms of debate in your own cities and towns. Your membership will help us give those tools to an ever greater number of people and places. Join the Strong Towns movement today and help us keep growing. In our last podcast, I spoke with Aaron Renn, the Urbanophile, about the city of Carmel, Indiana. It was an opportunity to learn more about Carmel's controversial experiment in large-scale, debt-driven suburban retrofit, and an opportunity to hear, though the voice of an authentic supporter, about what Carmel is doing. It is different than other North American suburbs, and while Strong Towns has not delved deeply into what is happening there, we’ve been prompted to do so many times. Some podcast listeners were upset that the podcast with Aaron wasn’t more of a debate, with me aggressively challenging the points being made. Others were thankful for the opportunity to have Carmel’s case made unmolested. Having heard the pro-Carmel narrative, this week we’re following up and offering a different perspective. Aaron called Carmel the anti-Strong Town, and there are some fundamental reasons why that is true. We ask the questions: How will you know that you’re wrong? When will you know? What Carmel has done is to—by Aaron’s own admission—build all the happy, pleasant, comfortable amenities today to attract people counting on future growth to cover the cost. In a sense, it’s a go for broke mentality. It’s impossible today to know if this will work. Furthermore, it’s disconcertingly self-affirming for people to convince themselves that they can today enjoy all of the fruits of a community’s future labor. What Carmel has done, in a very modern American way, is invert the time-tested process of making sacrifices today for a better tomorrow. A fiscally prudent approach to the same vision of tomorrow might involve Carmel's raising taxes on its residents, in order to make investments in things those residents want, based on a vision that these investments will ultimately pay off. What Carmel’s leadership has done instead is delivered on the amenities today, without requiring anything in terms of real sacrifice for a community that is currently wealthy. Carmel residents of today have no real skin in the game, at least not into proportion to the benefit they enjoy. Carmel residents of tomorrow, on the other hand, inherit a huge risk when that debt has to be repaid. That’s standard operating procedure for America’s suburbs; it’s just that Carmel has taken it to the next level. And then some. The incentives here are backwards. This ties into the concept of something being “built out,” that the things we are working on have a finished state that will ultimately be reached. The concept of “build out” is the ultimate hubris, the somehow our vision today is the correct one for all time. That we use our vision of the built-out condition to justify wild expenditures and massive debt so we can live with the benefits, without experiencing the difficulty of getting there, only makes the concept more suspect. In a place going for broke, where is the rigorous return-on-investment analysis? Where are the spreadsheets and special meetings going back and analyzing the assumptions of past investments, comparing those to the reality that has emerged, and using that rigor to inform future investments? Where is the estimate of the amount of growth and tax base needed to make the investments being made today successful? These don’t exist, and their absence is not a confirmation of competence. This is especially true in a city that has gone to great lengths to make expensive investments that intentionally signal, "This is a high-quality place run by highly competent people." Where we do have data, it is the blinking-red-light variety, where money is being shifted from one account to another to cover emergency shortfalls, debt is being rolled over without being retired, all with assurances that things are under control. In the absence of rigor on return-on-investment, those assurances ring hollow. 1. Debt being retired, not merely rolled over. 2. Return-on-investment analysis, especially backward-looking introspection. What were the assumptions we had and did they hold? 3. Hyper-transparency and challenging of assumptions, a systematic commitment to listing the assumptions of these large gambles, and ongoing scrutiny of their validity. 4. Leadership turnover with continuity of policy and vision. 5. Beyond the big and flashy, evidence of rigor about attention to detail. None of these things are apparent. Carmel feels like a place where a Robert Moses acolyte combined with a Wall Street hedge fund manager and an AICP planner who took a crash course in New Urbanism to build a city. Despite the outward signs of success today—which are easy to generate, but much more difficult to sustain—this is a place that seems fragile at its core. History tells us that when wealthy people come together to build fragile things, the public is ultimately called upon to bail them out when the predictable tragedy strikes. While it’s never clear what truck will collapse the fragile bridge, a combination of leverage, rosy projections, and a go-for-broke mentality suggests that someday, things won't look so optimistic in Carmel, and that bailout request will happen. Upzoned #5: Opportunity Zones, But For Whom? .... But where's that familiar intro music?! If you're looking for the regular Strong Towns Podcast, never fear—it'll be back next week. Today we're cross-posting a recent episode of Upzoned, a podcast we launched in September featuring Strong Towns's own Kea Wilson, Chuck Marohn, and occasional guests. Each week, they pick one recent news story that's part of the Strong Towns conversation, and they discuss it in depth. We wanted to make sure you haven't missed Upzoned—there's a new episode every Friday if you like what you're hearing! If you’re plugged into the urbanist blogosphere, you’ve probably heard something about the new federal Opportunity Zones by now. And you might even think they sound pretty good. After all, anything that incentivizes investment in underserved areas sounds like a pretty good deal—and by eliminating capital gains taxes on new development in some of the poorest regions of your state, there’s no doubt that the money will come pouring in. But Upzoned hosts Kea and Chuck aren’t so sure. Is a big bucket of money really what these neighborhoods need? Will outside developers really build the kind of locally responsive, fine-grained stuff that would make these towns strong and lift up the people who are already there? What would a better Opportunity Zones program look like—or is using a federal program to develop a neighborhood like steering an ocean liner with a canoe paddle? And then in the Downzone, Chuck and Kea talk about their recent reads. Hear Chuck’s final thoughts on Mariana Mazzucato’s The Value of Everything, and get the behind-the-scenes scoop on Kea’s recent interview with author William Knoedelseder on his new bookFins: Harley Earl, The Rise of General Motors and the Glory Days of Detroit. Strong Towns President and Founder Chuck Marohn is an avid reader, and every year, at the end of the year, Chuck publishes a short list of his favorite books of the year. The 2017 year-end list included a book called Dreamland by LA-based journalist Sam Quinones, about the rise of the American opioid epidemic. Recently, Chuck spotted Sam on social media describing himself as a fan of Strong Towns, and thought, “Can this be the same guy?” It was, and so for this week’s Strong Towns Podcast, we bring you a conversation between Chuck Marohn and Sam Quinones about the opioid crisis, and how it might relate to changes in the way we live in our cities and towns. A common theme between Strong Towns’s advocacy and Quinones’s work is the danger of seductive, simplistic solutions to complex problems. For us at Strong Towns, the complex problem is that of building a place that will have long-term, resilient value and prosperity. And the overly simple, purported miracle cures are everywhere—depending on who you talk to, it might be a freeway or a phony manufactured downtown or a convention center or self-driving cars or any number of other things. Growth itself as the solution to a city’s growing pains is another such miracle cure that, in practice, actually compounds our problems. The opioid epidemic started in an innocent way, with narcotic painkillers prescribed to patients—including Chuck’s father—who really did benefit from them. Quinones says narcotics can be part of a healthy, holistic approach to pain management. But that this approach has given way, in a trend that started accelerating in the 1990s, to a societal obsession with pills. Quinones runs through the fascinating history of how we got to where we are today—a society in which the crime rate is as low as it’s been in decades, but the overdose death rate is at a record high. The history runs from a 1990s revolution in pharmaceutical marketing (a new generation of drug reps “didn’t know what they were selling, but they all knew how to sell it”), to the rise of “pill mills” in the mid-2000s, to the proliferation of heroin throughout places that had never had a heroin problem, where pain pill addicts were easy marks for dealers. How is all this related to our development pattern, Chuck wonders. Or is it? Quinones says he does think it’s connected to the isolation brought on by the way we build our cities. Increasingly in modern America, you buy a big house, you drive everywhere, and you don’t know your neighbors. People could more easily be slipping into addiction and not have anyone checking up on them—or a neighbor or other community member to go to and say, “Hey, I’m in trouble here.” The opioid epidemic, more than any prior one, has been driven by shame. Even in Quinones’s research, few people were willing to open up to him about their own families’ experiences with addiction. And yet, there’s a bright side. Because it’s local institutions that have to deal with the fallout of the opioid crisis, local solutions are beginning to proliferate. Quinones says an inspiring number and variety of groups are involved on the ground in constructive responses to addiction: the PTA, the Chamber of Commerce, the Kiwanis Club, drug counselors, law enforcement, and many more. The response crosses political and ideological boundaries, and is actually bringing communities together in ways that may help us learn to solve other problems, too. The way we finance our cities has a huge impact on what gets built, when, and where. So if you’re inclined to think the municipal bond market is the most boring subject we could tackle on the Strong Towns Podcast, think again—because we have a truly eye-opening discussion for you today, on a topic with profound implications for anyone who cares about city building. Chuck talks with Jase Wilson, the founder and CEO of Neighborly, a startup which seeks to democratize public finance by making it possible for regular individuals to invest in municipal bonds—which fund projects from transportation infrastructure to sewers to broadband to parks to schools—and thereby directly contribute to funding community needs in places they are personally invested in. In doing this, Wilson says, he is really trying to return public finance to its roots. The municipal bond market, which is massive to the tune of $3.8 trillion outstanding, is more absurd and dysfunctional than most people realize. Historically, cities would sell bonds in the form of physical certificates, and you could invest directly. If your town wanted to build a new school, you could buy the bonds and become an investor in that project, in the same way you can buy a share of stock in an individual corporation. In fact, many early American towns grew on the basis of this kind of investment. Today, however, 80 cents of every dollar borrowed by a US community for a public project goes through one of 10 banks in New York. The process is byzantine and generally prevents individual buyers from directly investing in a community they care about—you have to go through a brokerage house. There are a huge number of middlemen in the system, and it’s often not clear who’s paying them. While innovations in private finance have dramatically reduced transaction costs and made investing more accessible to the average Joe (through e-trading, for example), these innovations haven’t reached the muni bond market. Chuck observes that this results in perverse incentives for local infrastructure projects. Big banks work at big scales. Funding packages are individually put together, and often cities face a dramatic “up-sell” during that process—so you might be told that a park is too modest a project, but why don’t you also build a new high school, and also consider expanding your sewer system, and so forth… bundling projects and inflating the cost until the bond offering becomes attractive to a large institutional investor. This is one way that municipal governments face intense pressure to go into deeper debt than is prudent. The market also rewards the tried-and-true over the new, Wilson points out. Innovative projects are less likely to obtain funding, because a small number of risk-averse players are responsible for structuring these deals. Neighborly seeks to disrupt this status quo by empowering individual investors to fund municipal projects. You can look at available investments by geography, or by type of project, and you can get in the game at a scale that makes sense. Should it take off, this kind of crowdfunding has the potential to revolutionize local public finance in a good way: by facilitating incremental, innovative, and right-sized projects for cities’ real, observed needs. And both Chuck and Jase are supremely excited. Check out the full episode to hear their excitement and more insights about what ails municipal finance. This bonus episode of the Strong Towns Podcast is cross-posted from our other podcast It's the Little Things. Want to better your community but don’t know where to start? Enter It’s the Little Things: a new, weekly Strong Towns podcast that gives you the wisdom and encouragement you need to take the small yet powerful actions that can make your city or town stronger. No matter your current role in your city—concerned citizen, elected official, city staff—you’ve likely had this thought about your local government organizations: they’re slow to create meaningful change. You’re not wrong. Councils postpone important agenda items; city job openings remain vacant for months; and, golly, that sidewalk you were promised sure has taken a while, huh? Bureaucracy—that term you hear everyone use to explain the pace of local government organizations—contributes, of course. But more so, it’s the inability to create, foster, and test out ideas from everybody in the organization. It’s, as my guest describes it, lack of innovation. In this episode, I chat with Nick Kittle. He’s the former Chief Innovation Officer in government, Government Performance and Innovation Coach at Cartegraph, and author of the recently released book Sustainovation: Building Sustainable Innovation in Government, One Wildly Creative Idea at a Time. Having worked in government innovation for almost 10 years, Nick knows innovation can be a buzzword that’s easier said than done. However, as you’ll learn in this episode, innovation is not another buzzword; instead, it’s an attainable workplace culture that, when embraced, can create meaningful change in our cities, towns, and neighborhoods. In other words: a very standard reaction from a group of professionals. This is human nature. One gentleman stood up during the ICMA Q&A and explained how his city directly charges road maintenance costs to impacted property owners, so they don’t have the problem Chuck described. Is that all roads? No, just new ones. Does that include collector and arterial roads? No, just local ones. Well, okay then…. Problem solved, I guess???? In this episode of the Strong Towns Podcast, Chuck describes a point of “peak delusion” where professionals all kind of see how the status-quo development approach isn’t working, and increasingly see that it isn’t viable over even the short term—yet persist in the faith that continuing on the current path will somehow resolve things. Their mantra: we just have to do more (of what hasn’t been working). Strong Towns' tone on municipal insolvency runs counter to actual data from ratings agencies, and present trends. And it’s not hard for those who want to avoid difficult thoughts to find affirmation. Our friends at the Market Urbanism Report like to point out that municipal bankruptcies are quite rare (since the Great Depression, when we entered the Suburban Experiment) and all the data, agencies and trends suggest they will remain rare. Yet, there are signs that change may be coming. Companies are buying back their own stocks at a record pace, yet senior executives are dumping their stock at even greater rates. Companies like McDonald’s, with seriously declining revenues, rising levels of debt and narrowing profit margins, are able to experience large share value increases, mostly due to buybacks. Interest rates are rising, as are budget deficits (in a booming economy, no less) to the point where the United States will soon spend more on interest than on the military. A company like Tesla, which loses billions of dollars annually while making only 80,000 cars per year, is now worth more than BMW, a leader in high-end automobile production that not only manufactured 2 million cars last year, but made 8.7 billion euros in profit doing so. BMW is full of smart people who continually do innovative things, yet somehow they are going to be out-innovated by a company led by a serial Tweeter building cars out of tents, yet still losing money. It’s kind of a crazy world. Yet, this is what Jim Kunstler predicted in his book The Long Emergency: a period of gimmicks and swindles designed to give the illusion that everything is fine, that it will all keep functioning like normal–or better–as far into the future as any of us can imagine. That’s a narrative Strong Towns advocates know to be false. That’s why we need to stay calm amid the craziness, keep working at making our places stronger, and be there when things go bad and we’re most needed. Get more of this conversation on this week’s podcast. Is Strong Towns the same as Sprawl Repair? If Strong Towns is not Sprawl Repair, then what is it? This question was posed to use on Twitter. Strong Towns Founder and President, Chuck Marohn, answers it in this monologue podcast. Sprawl Repair, sometimes also called Suburban Retrofit, is a concept that Marohn describes as “brilliant, but silly.” The brilliant part is a recognition that it takes real genius to adapt these incredibly difficult sites. Taking suburban homes, big box stores, and office parks – places that are not designed to be renovated – and renovating them for a productive takes tons of creativity. The Sprawl Repair Manual by Galina Tachieva and Retrofitting Suburbia by Ellen Dunham-Jones and June Williamson are examples of the brilliant. These concepts are brilliant, yes, but also silly, because while they may work in a handful of places where the desire and the economics come together, these strategies don’t scale to the broad swath of America that is financially insolvent, to the millions of homes that are in neighborhoods designed to decline. Silly is the belief — widely held among some advocates — that sprawl repair / suburban retrofit represents a real solution, that they can be something more than a boutique approach for niche places. Marohn contends that they are brilliant at being that unique solution, but they are not up to the bigger challenges of fixing our broken development pattern, which is the problem Strong Towns is trying to solve. This podcast delves into that problem – what really is sprawl and what are the underlying forces at work – then proposes a unique set of Strong Towns approaches, some of which include Sprawl Repair, but some which go far beyond it. Introducing Upzoned: a new podcast from Strong Towns! Strong Towns is dedicated to providing in-depth, thoughtful analysis on everything about the way our world is built—and that can take a little time. But sometimes, a hot new story will cross our desks that we need to talk about right away. That's where Upzoned comes in. Join Kea Wilson, Chuck Marohn, and occasional surprise guests to talk in depth about just one big story from the week in the Strong Towns conversation, right when you want it: now. In the first episode of Upzoned, Kea and Chuck used this article from the Texas Observer as a springboard to talk about the challenges of meeting basic water needs in Texas and other super-dry desert climates. Why aren't Texans building giant dams and reservoirs anymore? Will centrifuging our own pee like astronauts and building cisterns in the backyard really be enough to meet water needs n the deserts of Arizona and Nevada? Or will they need to take a note from earthship communities in Northern New Mexico who make it work on 8-10 inches of rainfall a year? Kea and Chuck discuss these issues and more in this week's Upzoned. P.S. It just so happens that the article prompting this discussion comes from the Texas Observer. Hungry for more discussion of how to build strong towns in Texas, and the inspiring things that forward-thinking leaders there are already doing? Come to Strong Towns's North Texas Regional Gathering, October 3-5, 2018 in Plano! More information and tickets here. Want to better your community but don’t know where to start? Enter It’s the Little Things: a brand new, weekly Strong Towns podcast that gives you the wisdom and encouragement you need to take the small yet powerful actions that can make your city or town stronger. It’s the Little Things will feature Strong Towns Community Builder Jacob Moses in conversation with various guests who have taken action in their own places and in their own ways. In the inaugural episode, Jacob sits down with former six-year Denton, Texas city councilperson Kevin Roden. It’s your chase to learn the essential information you need to run for city council—including how to run a successful campaign and get people behind your ideas—from a veteran who knows. If you’re like most people, you had these thoughts but you didn’t go out and actually run. Elected office is not for everyone, Roden says, but it’s another step a committed citizen can take in service to his or her community. If you are a policy wonk or have “a bit of a gut” for the messiness of politics, it might be the right step for you. Local office is unique because it’s all about meeting your constituents where they are, says Roden. Learn about the places he went on the campaign trail, how to find and stay in touch with the minority of people who will actually vote locally, and how to speak to the concerns of different groups while keeping your message authentic and consistent. Jacob and Kevin also talk about the hard work after you get elected of bringing people around to your point of view. There’s no substitute for travel and lived experience, Roden says, to understand what makes places work. Going on a walk with someone, for example, to show them how your city’s infrastructure makes it difficult and dangerous to cross the street is better than arguing with them about it on the dais. For these and many more insights, check out It’s The Little Things: our new podcast by our Community Builder, Jacob Moses. At Strong Towns, our focus is necessarily as specific as the issues we seek to confront are massive and multifaceted. We have made deliberate decisions about what is within the scope of our work, and what isn't, and where will can best amplify our efforts into actual results that far exceed the effort we put in. If you want to lead an effective organization, do you have the clarity to "say no to 80% of things that come in the door?" Marohn and Richards also discuss the future of CNU, and what the next big step in its evolution as an organization might look like. To this, Richards says frankly, "I don't know." CNU began in 1993 with the goal of removing impediments to traditional urbanism throughout North America. A quarter-century later, the organization is much broader, and its ideas are much more mainstream within the planning, architecture, and development professions. So where to now? A brief update from Chuck Marohn on the podcast feed, future program changes and the North Texas Regional Gathering. In this week’s Strong Towns Podcast, Chuck Marohn interviews Corie Brown, the co-founder of Zester Media. Brown writes about food and the food system, and is a former staff writer for the Los Angeles Times, Newsweek, Premiere Magazine, and BusinessWeek. Earlier this year, Brown wrote a story for The New Food Economy entitled “Rural Kansas is dying. I drove 1,800 miles to find out why.” Brown is from Kansas originally, and was aware of the state’s long, steady depopulation, but was struck by a report that rural Kansas had become a food desert: an area in which residents do not have adequate access to affordable and healthy food. The apparent paradox, Brown says, reflects the fact that Kansas has always had a commodity-based agricultural economy, not a subsistence one. The origins of Kansas’s settlement are not in family farms serving an immediate household and community, but in export agriculture, originally promoted by the federal government through grants of free land under the 19th century Homestead Acts. The carving up of the semi-arid Great Plains for intensive agriculture led to a slow-rolling environmental disaster that culminated in the Dust Bowl of the 1930s. The problem with commodity agriculture is that small farmers cannot compete with industrial-scale operations by making a higher-quality product. Says Brown, “A thousand-acre farmer in Ellis County, Kansas, is very specifically, directly competing with the government of China. Or the government of Brazil.” And the price that farmer can sell their wheat for is the price that the global commodity wheat market will bear. The result has been a relentless pressure to mechanize agriculture and improve efficiency, using less and less labor over time. Modern technology allows one farmer to manage a vast number of acres. The cost, however, is depopulation: fewer classmates for your children at school, and less access to culture and amenities. Thirty years ago, Brown, reflects, she was at a wedding in Downs, and it was a “quintessential small Kansas town”—there were people on the street, stocked shelves in the stores, a local newspaper. It was small, but active. “When I came back, it had lost a third of its population in 30 years. A lot of the store windows were blank.” Those business owners who were still around had moved their businesses out of store fronts and into their homes. Compounding rural Kansas’s suffering, says Brown, is that the state has a culture of bootstrapping—Kansas attracted people with nothing to lose. In a great game of musical chairs, “they all believe they won’t be the one left without a chair,” and pride can prevent people from acknowledging that they need help. Resistance is still strong in Kansas’s shrinking towns to the idea of dependence on government subsidies and assistance, or to the notion that the $1 billion a year that Kansas farmers already receive in federal farm aid even constitutes a subsidy. People work long, hard hours—“They’ve never worked harder”—and farmers who help feed the world don’t even grow vegetable gardens at home anymore, because they don’t have time. Marohn muses on the commonalities between this situation and inner city poverty: the food desert aspect, the long work for little income just to stay afloat, the isolation and lack of opportunity, and often the inability to leave if you wanted to—how can you sell your house in a place in the process of being abandoned? Who would buy it? And yet, most rural Kansans, both Marohn and Brown agree, would not see themselves as having anything in common with the urban poor. And while wealthier urban residents often look at the urban poor with empathy, they may not have the same degree of empathy for those left behind in depopulating small towns. Playing into this is Kansas’s own rural-urban political divide, in which the residents of the Kansas City suburbs who make up a large share of the state’s population are less attuned to rural priorities and needs, and may see rural Kansas’s politics as holding the state back. There are also the politics of immigration to consider. The only rural areas in Kansas to be gaining population are in the state’s southwest, where the meatpacking and food processing industries produce a lot of demand for low-wage labor, much of it provided by immigrants. What can Kansas do? There are no easy answers. Marohn asks Brown about the possibility of getting out of the commodity-wheat game and into something like organic produce. But this not only requires learning to do something new, but entails high up-front costs in equipment and infrastructure, and proximity to a major market for such produce. “It’s not that they’re unwilling to task a risk,” Brown says of Kansas farmers who might go organic; it’s that they can’t afford to take that risk. Given the lack of an economic raison d’etre for many of these small towns, perhaps the question that remains is whether they should continue to exist. Do we try to pour in outside resources, Marohn wonders, to save places that can’t be saved? Or do we do the economic-development equivalent of hospice care for a dying town—make the quality of life a little better for those who are still there? Brown says that in areas where the towns are too small to provide services, the people living there need to regionalize their local economies. Where five towns are no longer viable, one larger town might be: it might have the critical mass to provide a school, a pharmacy, and other basic amenities. But there’s a huge amount of work and cooperation and sacrifice involved in doing this. “In a lot of these towns where people have left,” says Brown, “the people that remain mow the lawns of the abandoned houses and maintain the look, because they have pride in their town and they don’t want people to know.” This pride of place can be a uniquely human strength, but in the end, it may also be a uniquely human failing. Chuck and Rachel discuss Chuck's recent event in Tulsa, OK and recent article, "Autism, PTSD and the City." They also announce an upcoming slackchat about incremental development and talk about the flooding in the Texas area. "Autism, PTSD and the City"
This week's slackchat on incremental development with Chuck Marohn, Thursday, August 31 at 1pm CT. More info. Does Strong Towns have a right to point out the problems with our current development pattern if we don't also have a clear solution? In this solo podcast, Chuck Marohn reflects on the state of the Strong Towns movement, its critics and its interactions with other movements like Market Urbanism and Complete Streets. This is our eighth dispatch from the Congress for the New Urbanism (CNU), which took place in Savannah, Georgia in May. Chuck Marohn attended CNU and hosted a series of in-depth podcast conversations about some of the most pressing topics for cities today, with leaders, thinkers, and activists in a whole range of fields. Now we're bringing those podcasts to your ears throughout the summer. Sophie Hicks, an architecture student at St. Clair College in Windsor, Ontario. Andrew Rodriguez, a city councilman in Walnut, CA. Mason Wallace, a small-scale developer in Charlotte, NC. Plenty of luminaries in architecture, planning, and related fields attend CNU, and there's a certain star-struck attitude that would be easy for a younger attendee beginning their career to adopt. Chuck turns that mindset on its head for the panelists, asking each of them, "Suppose I'm star-struck to meet you here. What's fresh, exciting thing you're working on that you think it's important to share with the world?" For Baisden, this thing is Rust Belt revitalization—reimagining and repurposing places that have the excess infrastructure and capacity to take in new residents and new ideas. For Wallace, it's spreading the message of incremental change in a booming city where that approach has not been the norm. Hicks is passionate about community engagement: changing the public's perception of an area like her hometown of Windsor and what might be possible there. Rodriguez has worked to correct mistaken ideas about renters and apartment housing in his Los Angeles suburb, in order to help the city chart a more sustainable future. When Chuck was 25, he tells the panelists, he struggled to have people take him seriously in professional settings. "You don't have grey hair," he'd be told. How do you deal with the challenge of working professionally with people a generation or two older than you? The answer, says Rodriguez, is to work extra hard to make sure he knows what he's talking about. If you're clearly well-informed and thoughtful, people will respect that. Engaging with people on a very personal level is also important for bridging generational and other divides, says Baisden—in dealing with members of the public who are of a different generation, frame your work in terms of stories they can relate to. Moving up in your field means being willing to be thrown into doing things that are beyond your pay grade, but not beyond your competence. You build upon what you know bit by bit, says Wallace. Over time, you form a coherent personal idea of what can and can't be done, and the ability to communicate it to others and sell them on your vision. One thing uniting this group of young urbanists is their recognition of the importance of place. All four are deeply interested in giving back to the places that made them who they are. The conversation turns to millennial activism and how it's often misunderstood—this generation works hard to change the world, but in different ways than their predecessors may have. Is it natural for each generation to be frustrated by the one preceding them, and baffled by the one that follows them? Chuck poses the question. Belying the stereotype that millennials tweet about events but don't vote or get involved, Baisden says he works with many volunteers and most of them are in their 20s and 30s. Millennials are entering adulthood with a different set of challenges—student loan debt and a housing affordability crisis—but also with a set of strengths. Those who have come of age with social media are natural storytellers and brand experts, flexible and accustomed to teamwork. How do we get this generation involved in dramatic, even revolutionary change in the way things are done in our cities and towns? How will the millennial generation push the future of the suburbs in different directions than their parents did? Listen to the podcast for these and more thoughts on the generational divide at CNU. “We are constantly told how the world is become a flaming dumpster fire,” says Chuck, introducing the day’s topic, “and that amid all these disasters, the only rational response is to do something really big. In fact, if we’re not doing that, we’re really not serious about things.” But is this “Go big or go home?” mindset the right one? The paradox of our era is that large-scale action to tackle national and global problems can feel simultaneously more imperative and less achievable than it did in the past. Doyon suggests that localism is what’s left to us, because any attempt to unite many people behind an ambitious, huge project will end up riddled with distractions and divisions. The community solidarity that we once might have called on to “do great things together,” in the words of Thomas Friedman, has broken down. In that context, how do you build momentum to address even local problems, let alone national or global problems that manifest themselves locally in place after place after place? Our panelists’ answers suggest that local relationship building is crucial—there is no way around working at that level. Then, once you have local success stories and models under your belt, you gain the ability to scale up and replicate what you’ve achieved. The Incremental Development Alliance is reaching the point in its growth where it can work directly with cities on changing regulations that are in the way of small-scale infill development. The credibility required to do this starts within communities, not with a national organization. In Columbus, Georgia, for example, a local property owner went person by person through the city council to persuade them of the value of adding on-street parking as part of a traffic calming exercise. Today's Strong Towns Podcast is the audio from a recent Ask Strong Towns webcast conversation featuring President and Founder Chuck Marohn and Communications Director Kea Wilson. 1. Long ago, Rockford, Illinois decided to not allow highway I-90 through the middle of downtown. The result was 8 miles of stroad headed to that highway, lined with big-box stores. Was Rockford really better off by not letting the highway into town? 2. If you have a town committee whose members look upon new ideas as something to dismiss or ignore or as a threat, and you want to introduce new ideas such as those of Strong Towns, how do you disrupt the status quo and get people to be open-minded? 3. You talk a lot about running local government using business principles—how cities need to actually take in more money than they spend. Why did we decide to calculate property taxes using the value of a property, instead of the cost incurred by that property? 4. Macon-Bibb County has had the highest pedestrian death rate in Georgia for 6 of the last 7 years. A review board was created to address the problem, but its focus has been entirely on blaming the victim—teaching people walking how not to get run over. We have two interstates and numerous stroads, and lots of financial challenges. How do I educate our leaders about the role of street design in pedestrian safety? 5. How do I convince my town’s director of public works and town engineer to plant street trees between the sidewalk and the street, rather than only on private property? 6. What cities are leaders in urban forestry? 7. I would like to increase the tourist industry in my town of about 100,000. It’s not an industry that’s well respected where I am. Do you have any insights into how to communicate the benefits of adding another industry to the economic base of this area? 8. I hear two views on how to address a housing shortage in Denver: 1) Add density, where you need it, but incrementally and with fewer zoning restrictions, vs. 2) Add density, but only in the form of large developments, so your city can make deals and require below-market-rate housing. What would you say to Person 2 to bring them closer to Person 1’s position? 9. How does Chuck feel about Duany Plater-Zyberk’s Smart Code and other form-based codes? Is form-based coding consistent with a Strong Towns approach? A long-time volunteer and contributor to Strong Towns, Andrew Burleson is a software engineer and project manager in San Francisco, California. He currently serves on the Board of Strong Towns. Andrew has been a key advocate for the transition of the group from an engineering-centric blog to a broader movement-building organization. Today, Andrew joins Chuck Marohn on the podcast to discuss the 2018 trend sweeping many of America's major and somewhat-less-major cities: electric scooters. Andrew tells Chuck about his experience with the rollout of a fleet of rentable, dockless, drop-off-anywhere scooters in San Francisco—before the city instituted a moratorium on the fledgling transportation revolution—and his conversion from skeptic ("It's not for me. I'm a grown-up; I bicycle. Scooters are a kid's thing.") to fan ("The low learning curve really is real. Just about anyone can do it."). San Francisco is in an unusual place among North American cities: it has "hit the parking ceiling." The city has a highly compact, walkable development pattern, but mobility issues for its residents center around limited space: space on packed trains, and space on the city's streets. Virtually "every inch of San Francisco that's not a building is a parking space," says Burleson. And yet, a dramatic expansion of the city and region's rapid transit offerings, to create a truly universal alternative to driving, is not in the cards. The Bay Area lacks the resources or the political will to build out subway lines that have been proposed over the years. What it can do is think differently about how urban space is allocated, and maybe teach other cities a lesson or two in the process. Cars take up a tremendous amount of space. Cars parked, or looking for parking, or waiting to drop someone off, are a major cause of urban congestion. The result, in a city like SF, is that the fastest way to get across town, for those able-bodied enough to do it, has long been bicycling. Bicycles can "fit through the gaps" while cars sit at congested intersections. Scooters, were they to become widespread, could dramatically expand a constituency that now consists mostly of cyclists: those interested in reconsidering how much space on our public streets should be dedicated to car drivers versus other users. Are scooters a form of "clutter" in the cities where they've been rolled out? What cultural norms govern the way we perceive scooters versus parked cars, and will those evolve? Are people comfortable with the hierarchy of urban street space now, or is there tension? How profitable is the e-scooter industry? Why are cities seeking to ban or restrict the proliferation of e-scooters? What is the future of scooters in our cities, given the current regulatory backlash? How could scooters affect other aspects of our development pattern, including the political acceptability of Missing Middle housing? This is our fourth dispatch from the Congress for the New Urbanism (CNU), which took place in Savannah, Georgia in May. Chuck Marohn attended CNU and hosted a series of in-depth podcast conversations about some of the most pressing topics for cities today, with leaders, thinkers, and activists in a whole range of fields. Now we're bringing those podcasts to your ears throughout the summer. In this episode, June Williamson (associate professor of architecture at the City College of New York), Dan Reed (urban planner and writer) and Galina Tachieva (managing partner at DPZ), discuss the clashes and overlaps between sprawl retrofit and suburban poverty. What's the latest research on sprawl retrofit? What are some successful examples of sprawl retrofit? Can retrofit happen using a basic, repeatable template, or do local leaders need to be equipped to decide what's best for their community? In smaller communities without deep pockets, where is the capital going to come from to make these sorts of changes? Where should we invest the money and time to do retrofit, and where does it make more sense to "re-green," i.e. return failing suburban developments back to nature? How do we, culturally, make these decisions when they impact real towns and real (often low-income) people? How do communities handle the increasing pressure on their suburban areas to maintain a certain lifestyle while many of the residents who live in these places simply can't afford the immense costs of suburban infrastructure? In communities dominated by failing suburban developments and utterly lacking investment, is there any strategy to save them? Many lower income Americans who reach a level of financial comfort want to make their homes in the suburbs. Should people (like New Urbanists) who feel they see the writing on the wall in terms of the declining future of suburbs tell these folks to give up on their dream of owning a home in the suburbs? What mental models and assumptions are enabling and underlying the decisions that have gone into the suburban development pattern? What will America look like 20 years from now if suburban retrofit succeeds? What percent of America can actually be retrofitted? Quint Studer is the founder of Pensacola, Florida's Studer Community Institute, a nonprofit organization focused on improving the community's quality of life and moving Escambia and Santa Rosa Counties forward. He is a businessman, visionary, entrepreneur and Strong Towns member. His new book is Building A Vibrant Community: How Citizen-Powered Change Is Reshaping America. How can we learn from other communities' successes without trying to copy exactly what they've done in our town? Why is downtown the best place to begin your community's revitalization efforts? Every month, we host Ask Strong Towns to give you a chance to ask your burning questions about our vision for change, and how the Strong Towns approach might apply in your unique place. The live Ask Strong Towns webcast is open to all Strong Towns members, but afterward, we share the audio on our podcast. What are some of the arguments you’ve heard over the years “for” parking minimums (i.e. leaving it the way we’ve always done it), rather than moving towards a parking maximum model? If I'm going in front of elected officials to lobby for a change, what arguments should I anticipate and how should I answer them? If a city has large green- or gray-field lots, what can it do to promote fine-grained development in these places, especially in climates where developers are hungry to build the biggest project they can? When talking to policymakers, how can you shift the conversation away from the overly simple "all density is good density" and towards adding value through a broader set of solutions, like mixed use development, multi-story buildings, limited parking, infill development, etc.? I go to college a few hours from my home, and my home is immediately outside of the principal city in my region. What can I do during my college years to stay involved in a city I don't live in at all during the year, but that I intend to move into after my career? What do you think of special “District” initiatives, the "Cultural Innovation District" in New Orleans? As a young(ish) engineer who subscribes to Strong Towns ideas and wants to make a difference in his home town, would you recommend that I pursue a planning degree in addition to my civil engineering degree, especially if I have a chance to work in city government? People in our small town tend to be very engaged and hold strong opinions. Big community issues can turn nasty, especially now with social media. Any suggestions on how to engage civil discourse without personal attacks? Our town is embarking on a large development project in the core of downtown financed via a Tax Increment Financing. The short version of the explanation we got from our Town Council is that the tax revenue generated from the new project will be set aside to fund the project. Doesn't TIF = debt? What questions would help enlighten our taxpayers? On this episode, Rachel introduces her colleague, Jacob Moses, who is Strong Towns' new Community Builder. Jacob discusses his unique background in technical writing and grocery store management, and how he ended up at Strong Towns. In this episode, Jeffrey Tumlin, Principal and Director of Strategy at Nelson Nygaard, and Corey Ershow, Transportation Policy Manager at Lyft, discuss the hype around autonomous vehicles and what the AV future might actually look like. How will autonomous vehicles fit into our existing taxi and ride-hailing network? How far are we in the technological progression toward autonomous vehicles? Autonomous vehicles seem to work okay on a closed course, but what about in a complex urban space? If we don't criminalize "jaywalking," how can humans and autonomous vehicles interact in a way that allows both to move freely and safely in an urban environment? Will autonomous vehicles take over our cities and marginalize pedestrians, or might the opposite happen as a result of automation? Will autonomous vehicles encourage longer suburban commuting? What are governments doing right, in anticipation of autonomous vehicles? This week, Rachel's guest is Connor Nielsen, our summer intern who is working with both Strong Towns and our friends at the geoanalytics firm, Urban3, to share data-related stories throughout the next few months. Connor talks about what led him to this internship and what he hopes to work on this summer. This is our third dispatch from the Congress for the New Urbanism (CNU), which took place in Savannah, Georgia in May. Chuck Marohn attended CNU and hosted a series of in-depth podcast conversations about some of the most pressing topics for cities today, with leaders, thinkers, and activists in a whole range of fields. Now we're bringing those podcasts to your ears throughout the summer. In this episode, David Rau, a New York-city based architect and Steve Mouzon, an architect and author of The Original Green, discuss the past, present and future of American architecture. They contemplate what it means for a new generation to reject or forgive the design choices of previous generations, particularly in light of recent conversations about the removal of Confederate monuments in American cities. What are the key differences between traditional architecture and modern architecture? Is a willingness to accept or reject changes as humans wired into our DNA? Are liberals more interested in moving forward and conservatives more interested in keeping this as they are? How does the concept of absolution apply to current conversations about new urbanism? What does the process of absolution look like? How can we be fair judges of city builders in the past while still maintaining a critical eye toward their failings? As city builders today, how would we want to be judged by future generations? Is our ability to absolve people and places of the past correlated with the level of power we have or have not gained today? What makes a place "lovable?" Rachel's guest this week is Michelle Erfurt, Strong Towns' Pathfinder. She shares an update on Strong Towns' events for the year and the amazing reach that the Strong Towns message has been having. Michelle and Rachel also dish about their latest favorite books and tv shows. If you want to book a Strong Towns event, head to this page to get in touch with Michelle. This is our second dispatch from the Congress for the New Urbanism (CNU), which took place in Savannah, Georgia in May. Chuck Marohn attended CNU and hosted a series of in-depth podcast conversations about some of the most pressing topics for cities today, with leaders, thinkers, and activists in a whole range of fields. Now we're bringing those podcasts to your ears throughout the summer. One month after the Congress, today's podcast guests are Andres Duany and Kevin Klinkenberg, who discuss the host city of Savannah. Andres is one of the founders of CNU and Kevin is a long-time Savannah resident. Both are architects and planners, and both were deeply involved with producing the Congress this year. What makes Savannah such a unique place? Why didn't the rest of Savannah develop in the same traditional, walkable manner as the city center? How has auto-oriented design impacted the historic core of the city? How do you balance historic preservation concerns and the need to allow cities to move forward? What's the impact of large developments like convention centers and arenas? Why is it so hard to get things built? This is our first dispatch from the Congress for the New Urbanism (CNU), which took place in Savannah, Georgia in May. Chuck Marohn attended CNU and hosted a series of in-depth podcast conversations about some of the most pressing topics for cities today, with leaders, thinkers, and activists in a whole range of fields. Now we're bringing those podcasts to your ears throughout the summer. Today's podcast guest is Monte Anderson, a developer based in Texas and a leader of the Incremental Development Alliance. Monte encourages people to pick a place they love and stay there. That's how you really learn what communities need and how to make them better. And that's what he did by choosing to incrementally improve his hometown. What if your town seems past the point of getting better? Should you stay anyway? What needs to happen in order to encourage development in our towns? How do you respond to people who worry that the removal of parking minimums will be harmful to local businesses? What's the best sort of business to kickstart a commercial street? How do we reconcile the desire to be flexible and encourage new business start-ups, especially in poor neighborhoods, while still ensuring that buildings are safe and basic health codes are met? What are the first steps someone should take if they want to become an incremental developer? What if you don't have much money? How do you find a balance between investing in a neighborhood and not pricing people out of it? What's the difference between a developer and an investor? A few decades ago, Beth Berry lived in Austin, Texas with her four children. The pace of life in that big city eventually caught up with them and they decided to move south to Mexico to find something different. Beth started writing, cooking, walking and observing the family-centric life around her. "I was learning to not have an agenda and let curiosity lead me," she says. "The culture shifted my perspective on what I needed to do to be okay, to be worthy, to be successful by some measure." Since then, she has moved back to the United States and begun working as a life coach with mothers who share similar concerns about the unceasing pace of American life, and the burdens and impossible ideals it lays on women. In this engaging conversation with Chuck Marohn, Beth discusses the pressures of modern parenthood, the loss of "the village" when it comes to raising children, and the way the design of our communities furthers disconnection and isolation. The Week Ahead: Thank you! On this episode, Kea and Rachel recap the recent member drive and chat about some recent favorite books and shows. A huge thank you to the 150 new members who joined us last week. If you didn't get a chance to become a member yet, you can still do so right here, right now. If you've been waiting — been putting this off all week — we're here to help you get past the finish line. Here's the number: 844-218-1681. Ask for Chuck. Ask for Kea. Ask for Rachel or Max or Bo or Michelle. We're all sitting here waiting for you to call. We'll chat a little and then get you signed up to be a member of Strong Towns. It's that easy. Or, just sign up on your own. That's easy too. Just click here to join a movement that is making important change happen. Today's the day. Before you head out for a long weekend, take a quick minute to make a huge difference. Here's what gives me hope. On Day 4 of the Spring member drive, Chuck recaps a typical day in the life as president of Strong Towns. Then he discusses a question he received on a recent Ask Strong Towns webcast about the negative nature of so much of what Strong Towns discusses, and whether there is any way to find hope. In this first episode of our Spring member drive, Chuck reflects on a promise he made to Strong Towns three years ago, and how that decision changed the trajectory of this movement forever. In today’s episode, Chuck and Kea discuss several audience-submitted questions on topics ranging from TIF and bonds to historic preservation to how to campaign on a Strong Towns platform. Down-zonings are a common tool around here for the local aldermen to get what they want. I’m a believer that they make the development process longer, more expensive and, subsequently, lead to gentrification. What’s the Strong Towns take on down-zonings? What are appropriate things that a city should issue bonds for? What resources are available for a small town without a big planning department or budget to review their zoning code and best practices? Many are excited about the new Strong Towns initiative in Akron, Ohio. What happens if it’s a resounding success and demand skyrockets? Is there ever a good TIF project proposal? Is incrementalism diametrically opposed to historic preservation or do these two movements in fact share common goals? My city leadership has been slow to confront our housing issues. What would you say to a local leader to make them see that housing is a problem that deserves their attention and priority, particularly when those impacted are underrepresented among the (small town) political elite? A lot of your articles are depressing. What gives you the most hope for America's towns and cities? Visit the Ask Strong Towns page to learn more about this webcast, submit a question and get info about the next episode (happening June 28th). What's it like to get started as a small scale developer? What does being a developer look like and why do it in the first place? How do you weight the costs and benefits of a given property (both monetary and non-monetary), and make the choice to pull the trigger on a purchase? Is it possible to provide quality affordable housing and still break even or make a profit as a small scale developer without deep pockets? What are the challenges and benefits of being a landlord? How can we incentivize more landlords to care about their tenants and neighborhoods? What financial, social or political systems would need to change to make this the norm? Rachel's guest this week is Strong Towns member and occasional writer, Alex Baca. Alex just published an article on Strong Towns called "Homeownership for whom?" about the flawed model of homeownership as a platform for building household wealth — and who is excluded by that model. Alex and Rachel discuss the position of homeownership in American culture and the economy. They also chat about Alex's thoughts on bikeshare and recent updates in the bikeshare world like dockless bikes and scooters. Follow Alex on Twitter @alexbaca. 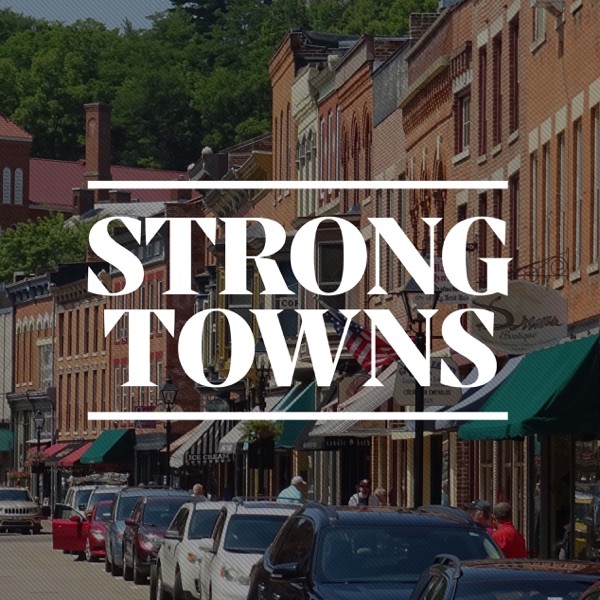 Today we've got the audio from a recent Ask Strong Towns webcast conversation featuring friend of Strong Towns and Principal at Urban3, Joe Minicozzi, and hosted by Chuck Marohn. Rachel's guest this week is Strong Towns Growth Manager, Max Azzarello. He discusses his nomadic lifestyle and the reason he might be settling down somewhere permanently soon. He also talks about why he drives a scooter and a recent book he's been digging. Chuck has been meeting with local leaders across the country for the last several months in closed door conversations. One question he often asks these elected officials and city staff is "What do you wish people understood better about your job?" He consistently receives a very similar set of answers: "We wish the public understood how difficult this job is." "We wish people grasped how limited our resources are." "We wish people appreciated how much we do and had a little more patience." ...and on and on. The truth is that wishing these things will never make them happen, he argues. City leaders have to do their jobs despite the lack of resources and appreciation. If you want to work for a city government and make decisions on behalf of your town, you will receive critiques and high expectations, says Chuck. Here's the real question: How do you do the job despite these things? Hear Chuck's answers on this latest episode of our podcast. Rachel's guest this week is Chuck Marohn, and he recaps a recent series of events in Akron, Ohio as well as his article for today, The Real Reason Your Local Mall is Failing. Join us for upcoming public events in West Grove, PA, Wichita, KS, and Chattanooga, TN. Strong Towns members are invited to attend our April 30 Q&A Webcast with special guest Joe Minicozzi of Urban3. This week's guest is Strong Towns Development Director, Bo Wright, who discusses the organization's new partnership in Akron, Ohio, which will spur a yearlong conversation on how to make the city a strong town, supported by the Knight Foundation. Bo talks about what we hope to accomplish this year in Akron and why it matters to everyone — not just Akron residents. Contact quednau@strongtowns.org if you have a request for a future guest on this podcast. If you're in the Akron area, please join our Strong Akron Facebook group to follow this conversation. Visit www.StrongTowns.org/Podcast for the show notes. Who is against you? That's a question Chuck Marohn is often asked when he presents Strong Towns ideas at events and in conversations. One group in particular is a growing voice in opposition to Strong Towns. These are the folks who say: "We really like Strong Towns. We like your ideas... But don't you see that the problems you're discussing are so big and intertwined with so many other challenges that we can't afford to act incrementally? We have to take major steps to solve major problems. Small-scale actions are not going to cut it here." Today on the podcast, Chuck responds. Rachel's guest this week is Strong Towns member and contributor, Arian Horbovetz, who blogs at The Urban Phoenix and lives in Rochester, New York. He discusses the universal challenges that Rust Belt towns deal with, his optimistic yet pragmatic view on urban revitalization, and his sociologist's perspective on these trends. Every month, we host Ask Strong Towns to give you a chance to ask your burning questions about our vision for change, and how the Strong Towns approach might apply in your unique place — and give us a chance to share our answers with the world, so it might help other Strong Citizens. The live Ask Strong Towns webcast is open to all Strong Towns members, but afterward, we share the audio on our podcast. What makes for a good urban road? I live in a city where the economy and population are growing. How can we build momentum for a Strong Towns approach in a place like this? What are your thoughts on home-sharing systems like AirBnB and short-term hotels? You present a simple and compelling argument for why our development pattern is causing our cities to go bankrupt. What factors are not being considered when we look at tax value per acre maps? What needs to happen so that more people can be engaged in local decision making and planning processes? My town has a walkable main street with some vacant land surrounding it. Should we prioritize strengthening our main street or developing the vacant land into something more productive? Rachel's guest this week is Chuck Marohn who recaps a recent trip to Massachusetts and discusses his article today on autonomous vehicles. A couple weeks ago, Chuck Marohn shared an image on Facebook that sparked a contentious conversation. It was an illustration of a potential retrofit project, turning a suburban big box site into a slightly denser — but still quite auto-oriented — development. Comments rained in from other Strong Towns advocates, many in agreement, others pushing back. Then the developer who originally posted the image called us and asked to talk. So we invited him onto our podcast. Bob Barber is a founder partner at Orion Planning+Design, a Mississippi native and the former planning director for the City of Hernando, MS. In this conversation with Chuck Marohn, Barber discusses the challenges and different approaches to pushing for change in smaller, more suburban communities. In his experience, the people who approach change from a positive angle in the communities where he works have a much better chance of building a strong town than the people who begin by putting the community down and pointing out where it has gone wrong. Rachel Quednau, Communications Director for Strong Towns, hosts this conversation with Mayor Gavin Buckley and Sally Nash, Chief of Comprehensive Planning for Planning and Zoning in Annapolis. They discuss the ways that the city's waterfront is integrated into the life of the community, unique small business and placemaking efforts in historic neighborhoods, how Annapolis is handling the challenges ahead and more. Listen to the Muskegon, MI podcast, then vote for the strongest town in this match-up: http://strongtowns.org/journal/2018/3/20/round-3-annapolis-md-vs-muskegon-mi Voting closes at 12pm CT on Friday, March 23. In this conversation, president of Strong Towns, Chuck Marohn, chats with Kent City Manager Dave Ruller. They discuss unique planning processes in the city, the energy that college towns offer, and how the community approached a recent controversial issue. Listen to the Pensacola, FL podcast, then vote for the strongest town in this match-up: http://strongtowns.org/journal/2018/3/20/round-3-pensacola-fl-vs-kent-oh Voting closes at 12pm CT on Friday, March 23. In this conversation, president of Strong Towns, Chuck Marohn, discusses Muskegon, Michigan with Muskegon Lakeshore Chamber of Commerce President, Cindy Larson. They chat about Muskegon's unique farmer's market, challenging developments in the city's past, the advantages of being a lakefront community, and more. Listen to the Annapolis, MD podcast, then vote for the strongest town in this match-up: http://strongtowns.org/journal/2018/3/20/round-3-annapolis-md-vs-muskegon-mi Voting closes at 12pm CT on Friday, March 23. In this episode, Rachel Quednau, Communications Director of Strong Towns, talks with Christian Wagley of Pensacola, Florida about a unique citizen engagement and education effort, a transformative road diet on the city's Main Street, how the community is prudently utilizing settlement money from the BP oil spill, and more. Listen to the Kent, OH podcast, then vote for the strongest town in this match-up: http://strongtowns.org/journal/2018/3/20/round-3-pensacola-fl-vs-kent-oh Voting closes at 12pm CT on Friday, March 23. In this episode, Chuck Marohn discusses the dynamics of school funding and facilities in his community. While some schools are well cared for and receive regular improvements, a historic neighborhood school has been slated for demolition. One of the reasons? Because the school next door wants an additional parking lot. Why do our communities make these decisions? How do we fight back while balancing the financial needs of so many other services (and other schools) that our cities have to provide for? Rachel's guest on this week's episode is Strong Towns Director of Community Engagement, Kea Wilson. She talks about some recent articles she's written on safe streets issues in her city of St. Louis, MO. Kea and Rachel also discuss the current standings in the Strongest Town Contest. Round 2 kicks off tomorrow so don't forget to tune in and vote. Join us on Wednesday at 11am CT to discuss the contest on Slack. Chuck Marohn returns to the Week Ahead podcast to report on recent events in Bismarck, North Dakota; West Palm Beach, Florida; and Thomasville, Georgia. Then he and Rachel dish about the 16 towns selected for the 2018 Strongest Town Contest. See the final bracket, read each town's submission and cast your votes here. This week's guest is Sarah Kobos, a Strong Towns member and contributor who lives in Tulsa, OK. She talks about how she became an "accidental urbanist" and started getting involved with city planning in her community. She also discusses the slow but rewarding process of rehabbing a rental property. We recently invited Jeff onto our webcast to chat with Chuck Marohn about how to build slower, safer streets and why this goal is so important if we want to live in prosperous, successful cities. This is the audio from that webcast. To watch the video and see a list of questions, visit this page. And don't forget to nominate your community for our Strongest Town Contest! Nominations are due by February 26. Rachel invites Strong Towns member and contributor Daniel Herriges onto the podcast to discuss his ongoing series about gentrification and why this issue has so firmly divided two groups of people who could actually gain a lot from working together. Rachel also shares an important reminder: Nominations for the Strongest Town Contest are due February 25. Apply today! Join us February 20 in West Palm Beach, FL for a public event led by Charles Marohn. Our streets should be safe for everyone — yes, even those who are under the influence. One year ago, a woman in suburban Oregon crossed the street while under the influence of alcohol and was struck by a driver and killed. Her husband's lawyer couldn't find an engineer in his state who was willing to stand up to the Department of Transportation (DOT) and speak out about the dangerously designed street that played a part in this woman's death. So the lawyer called Chuck Marohn, President of Strong Towns, and he recently traveled to Oregon to testify as part of the case again the DOT. In this episode, Chuck reviews the case and discusses the dangerous design of the road that led to an innocent mother's death. Richard Florida, author, editor and Professor at the University of Toronto, is part of a growing chorus of prominent thinkers across the country who are speaking out against the race to the bottom that Amazon's search for a second headquarters has induced. Strong Towns is fully in agreement that cities should compete on their merits and strengths, not on the amount of local tax dollars they're willing to pony up. So Florida wrote a letter and invited urban leaders, developers and economists to sign onto it — Chuck Marohn included. The letter asks elected officials in the HQ2 finalist cities to sign a mutual non-aggression pact that rejects egregious tax giveaways and direct monetary incentives for Amazon. So far, more than 1,100 people have signed it. You can join them. In this short conversation wtih Chuck Marohn, Florida discusses the letter and what motivated him to get it going. In this episode with featured guest, Chuck Marohn, Chuck discusses his complicated relationship with Kansas City, MO culminating in a recent successful event there. Chuck also introduces the newest member of his family, Gryffindor the puppy! And Rachel introduces the 3rd annual Strongest Town Contest — with some new twists. Nominate your city for the Strongest Town contest! Applications due February 25. Chuck Marohn reviews the recently leaked White House infrastructure plan and discusses the ways in which it aligns with Strong Towns principles, as well as the places where it falls short. Read more about it here and follow our ongoing infrastructure conversation here. Rachel's guest this week is Strong Towns member and contributor Alexander Dukes, who just concluded an ongoing series on our site called A Town Well Planned. He talks about the inspiration for and response to his series, plus what it's like to be a community planner in the US Air Force. In this short, bonus episode, Chuck reads one of his recent articles about the chasm between the values of the average person and the values of the engineer. See the text of the article here. Across the country, a movement of local doers is taking hold — one where problem solving happens from the bottom up instead of the top down. We're seeing this in everything from the way we educate ourselves to the tools we use to get places. The energy is coming not just from governments but also business leaders, teachers and scientists, and the solutions are interdisciplinary, too. This is what Bruce Katz, Centennial Scholar at the Brookings Institution, argues in new book, co-authored with Jeremy Nowak, The New Localism: How Cities Can Thrive in the Age of Populism. In this episode, Chuck interviews Bruce Katz about his book, this new localism movement and how it could shape a better future for all Americans. In this episode, Rachel has Chuck Marohn on as her guest to discuss a special Strong Towns focus on the need to build safer, slower streets. They also talk about some upcoming webcasts, with a side of football. If you're from any part of America besides Los Angeles, you've probably dissed the California city at one point or another. It's full of smog, traffic and vain movie stars, right? But that narrative misses out on so much of what L.A. has to offer. Not only is the city an exciting and rewarding place to live for many people, it's also, surprisingly, a great place to raise a family and — believe it or not — a good place to walk and bike. Alissa Walker is living proof of this. She's the Urbanism Editor for Curbed and a long-time resident of Los Angeles. She's made the city work for her and actually says that walking or biking is often easier than driving in her neighborhood. When she realized this a few years back, she ditched her car and has been enjoying bus rides, bike rides and walks with her family ever since. She's also watched the city around her change as investments in public space, walking, biking and transit grow. Alissa's hopeful that cities like hers will continue to figure out ways to welcome and accommodate families. This thoughtful and fun conversation with Alissa Walker will challenge your Los Angeles stereotypes and help you think about what it means to build a family- and woman-friendly city. Visit the Local Conversations page to find Strong Towns members taking action in your region. Learn more about the inner-city highway project that residents are fighting against in Shreveport. This week Strong Towns president Chuck Marohn discusses risk, his own approach to investing and what it means for local governments to make investments that minimize risk and maximize potential gains. In this episode, Rachel asks Chuck Marohn why our cities need a 12 step program to get them out of their financial struggles. Rachel and Chuck also discuss some upcoming online opportunities for readers and listeners to engage in the Strong Towns movement. If you've got an idea for a Strong Towns staff member or contributor that you think would be a good guest for this podcast, email Rachel. This week's open Slackchat with Chuck will take place at 12pm CT on Wednesday. Join us for a free webcast about the American Infrastructure Crisis, January 16 at 11am CT.